STEAM Volunteers mark their scheduled classes on the calendars below. This helps ensure the availability of resources during the scheduled time. Please contact Wendy or Gabe for passwords. When are the classes taught? Classes are taught during school hours (8:25 - 3:00). The STEAM classroom leader and the classroom teacher work together to select a time that works best to teach the classes. Teachers understand that they need to be flexible: many of our volunteers have fulltime jobs. How much time commitment? PreK and TK have 4 one-hour lessons, grades K through 4 have 8 one-hour lessons and 5th grade has 6 lessons that are about 90 minutes each. It is a good idea to spend some time at home reviewing or practicing the lesson at home with your child so you are familiar with what to expect. Some lessons require photocopying of the student handouts which can be done at school taking minimal time. Will you train me? YES! We want you to be successful! We have a very high rate of volunteers that return each year. There are training sessions by grade level at the beginning of the year (usually in October) once classroom leaders have signed up. In addition, if you have any questions during the year you are more than welcome to email us or meet in person. What materials do you use? 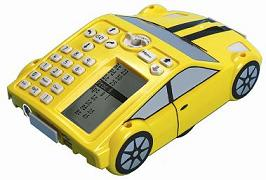 (robots, languages, etc...) Preschool - Grade 1 use the Bee-Bot. Grade 1 - Grade 4 use a Pro-Bot which uses Logo language and a pen so students are able to see the output of their program. Grade 4 and Grade 5 use Scratch which is a free visual programing language. Grade 5 uses Scratch and Scratch with Arduinos. What grades get these lessons? The lessons are for all of our students: Preschool to Grade 5. The lessons build on the students’ previous knowledge and progress in difficulty. How much does it cost? The STEAM program is fully funded by the FFC. All of our instructors are parent volunteers. The program would not exist without our volunteers like you! Do the teachers teach it? The classroom teacher remains in the classroom and help with the lesson and provide classroom management suggestions. The STEAM leader is the “teacher” during the STEAM lessons. Does it require a CS degree? You do not need a CS degree to volunteer to teach STEAM to our students. Starting in Grade 2 it is helpful to have basic programing knowledge since repeat loops are taught and in Grade 3 procedures are taught. All of the lessons are provided and many parents without a CS degree have been successful leaders. STEAM classroom helpers are useful even if they don’t have a computer science background. What if I can’t commit to teaching all the lessons? Sign up! Often a classroom has more than 1 parent who is interested in teaching lessons. The lessons can be divided among the interested parents so each leader only teaches a few lessons during the year. How do I get these lessons for my kid? STEAM leaders are provided with the links to the Google Docs of the lessons for their grade level. Why should I volunteer? The STEAM program will not happen without a volunteer from every classroom. It is amazing to see how much progress your child and their classmates make in learning about programing during the lessons. You want your child to start getting the skills they need to be successful in the future! Sign up to volunteer on www.dingeman.net under “First Day Packet.” If the classroom leader position is already filled, email steam@dingeman.net and tell us your name, your child’s name and teacher. Get you volunteer clearance packet turned into the school office ASAP. Wait to receive an email indicating your grade level training meeting which will be in the morning before school late September or early October. Meet with your classroom teacher to schedule the lessons. The STEAM program aims to bring in Science, Technology, Engineering, Art & Math enrichment to all students at Dingeman. 2014-15 was our pilot year, and it was a huge success thanks to the amazing participation and commitment from our parent volunteers. As STEAM leaders, our goals are to not only teach students about early technology concepts, but also to get ALL students interested in science and technology, and feeling like it is something they are capable of doing today and in their future. This year, we shall continue to use the programmable floor robots, Bee-Bots and Pro-Bots, in the classrooms Pre-K through Grade 4. Grade 4 also learns to program in Scratch. If you are interested in exploring the Bee-Bot now, there is a free iPhone Bee Bot app. Grade 5 will be working with: Arduino along with Scratch. The STEAM curriculum follows the school’s vision of creating fun, inquiry-based lessons, that meet the Common Core Standards. We have 6 to 8, one-hour lesson plans per grade-level, except for Pre-K and TK, which have 4 lessons each. All lessons take place during the school day. We also encourage our students to practice their programming skills on code.org, and participate in the Hour of Code during the Computer Science Education Week in December. We are already recruiting STEAM volunteers for the 2018-19 school year. If you are a new or returning volunteer and are interested in being a classroom leader or volunteer, please email the committee chairs. This program would not exist without volunteers. Grade level training info will be sent by email soon. The goal of the Pre-K/T-K lessons is to introduce the students to the Bee-Bots, one of its simplest commands, and to have fun with technology. Students are introduced to the basics of programming using the directional commands on the Bee-Bot . The lessons are aimed at developing problem solving skills and a sense of logic. The assignments are well integrated into the classroom topics of sequencing, ordinality, identification of shapes/patterns, etc. The students work with both Bee-Bots and Pro-Bots this year. 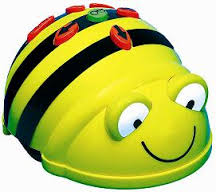 The Bee-Bot is used in programming assignments that utilize all its capabilities, while connecting to topics/activities in the classroom such as navigating the map of an area, addition, place values, shapes/patterns, etc. The students transition to introductory lessons on the Pro-Bot after five lessons with the Bee-Bot. The students learn about sequential programming and repeat loops via the Pro-Bot. The first couple of lessons reinforce the use of linear measurements and directional commands. Next, the students decode compass directions and map them to directional commands on the Pro-Bot. A simple intro to optimization follows, with the Pro-Bot being directed to various stores to minimize the total cost. Next, students identify repeating patterns in given figures and learn to create them using repeat loops. We wind up the year with a debugging lesson, that allows the students to find errors and fix broken code. The students continue to build up on their knowledge from the previous years. After a quick review of sequential programming and repeat loops, the students are introduced to the principles of modular programming and simple optimization. The programming assignments are designed to be practical applications of the Math concepts learned in the classroom, including area/perimeter, coordinate geometry, properties of quadrilaterals, etc. Next, the concept of reactive programming is introduced via a relay race that uses touch sensors on the Pro-Bot. The final assignment for the year focuses on honing the students’ debugging and editing skills. The focus is on working with angular measurements and reinforcing the concepts of geometry from the classroom. The students start off with a review of programming concepts from the previous years, and work on problems involving area/perimeter. The next four lessons involve angular measurements using the Pro-Bot, and creating various types of figures using repeat loops & procedures. The students identify the properties of regular polygons, and develop a generalized algorithm to draw regular polygons. Next, the concept of reactive programming learned in the previous year is reinforced with sensor related projects. Lastly, students work on their debugging and editing skills, identifying and fixing broken code, and modifying code to achieve new functionality. The students move on to more advanced platforms - the Arduino microcontroller, used in conjunction with Scratch. The students learn new programming concepts, and apply it to topics learned in the classroom. The focus is on developing interdisciplinary projects that combine Computer, Electrical and Mechanical Engineering with various subjects such as Physics, Math, Biology, Music, etc., and represent some of the practical applications of the theory. The first two lessons are intended to familiarize the students with the Scratch platform. The next four lessons involve the Arduino, with Scratch being used as the IDE. The lessons are directly related to the topics of energy, force, electricity and food chains that are part of the grade 5 standards. Students and their parents or guardians are invited to participate in a night of fun and learning together. Each night will have 6 grade level appropriate experiments that families will rotate to. The events will take place from 6:30-8 pm on the dates below. Several weeks before your grade level's date please sign up through a sly reply that will be in the e-blast. There are limited spaces so sign up right away!